No longer will you have to rely on the fridge door to remind you of birthdays and appointments. 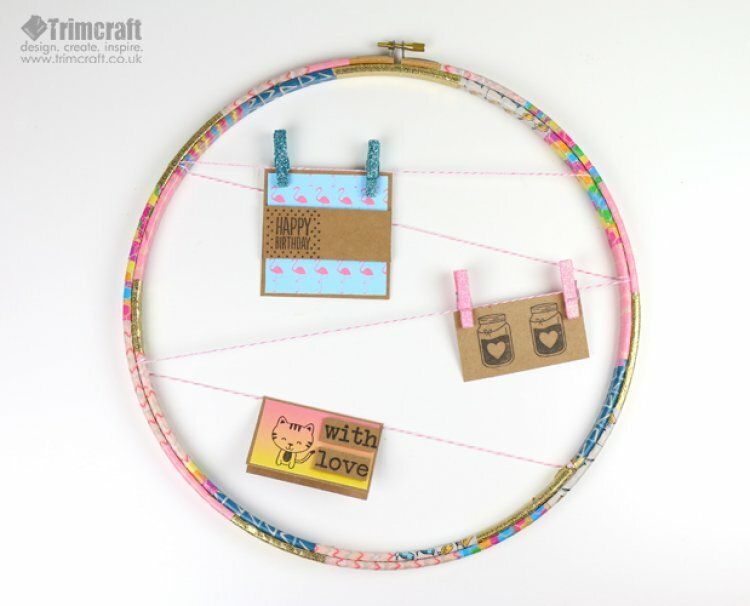 With just one embroidery hoop and a selection of the vibrant Dovecraft Washi tapes to decorate, you’ll be on your way to adding a stunning addition to your wall at home! 1.Undo the embroidery hoop until you have two separate hoops. Wrap each one with different patterned Dovecraft Washi Tapes. TIP: Wrap small pieces of tape around the hoop rather than doing longer strips, this will spread the tape out better and vary your design. 2.Wrap a length of Dovecraft twine around the inside hoop and across to the opposite side in a diagonal pattern. Ensure to attach both ends of your twine on the inside of your hoop with a piece of washi tape. 3.Put the hoop back together and tighten at the top to hold your twine in place. 4.Now it’s time to add some note cards to your notice board! Maxine has cut out a variety of sizes from Dovecraft Kraft Cardstock. TIP: Fold your kraft card so that it can hang without pegs. 5.Cut out smaller rectangles of the Simply Creative Happy Days paper and add these to the front of your Kraft note cards. 6.Add illustrative detail by stamping a few designs from the collection of Dovecraft Wooden Stamps onto additional pieces of Kraft cardstock or onto the pieces of Happy Days paper you glued on. 7. Maxine has also used 3D foam pads to add dimension to her sentiments. Using pegs, attach your note cards to your twine to finish. Remember to upload your DIY Home Décor projects to the inspiration area and to #Trimcraft on social media, we’d love to see how you’ve been inspired by this tutorial!